Chief Election Officer Keith Lowenfield last evening denied a claim by the PPP/C that the Guyana Elections Commission (Gecom) had rejected its lists of names to serve in the administrative regions, stating that the party knew the commission’s offices were closed and arrangements were made for the lists to be submitted today. The PPP/C in a short press release yesterday afternoon said that it presented its ten lists of regional candidates to become councillors, but they were not accepted by the commission. “The lists were submitted to the Guyana Elections Commission and rejected by the authorities there,” the party said in the statement. “Rejected by whom?” questioned Lowenfield last evening when contacted by this newspaper. According to Lowenfield, all of the Gecom offices were closed yesterday since the staff were on a one-day retreat at Splashmin’s Fun Park which was approved by the commission and Minister of Finance Winston Jordan. He said that during the course of the day the PPP/C’s agent for the last elections Ganga Persaud contacted him and indicated that he wanted to submit his party’s regional lists. The CEO said he explained to Persaud that they were out of office but that he was prepared to work today and advised that he take along soft and hard copies of the lists so that he could make a quick comparison with what would have been submitted on Nomination Day. “We had a gentleman’s agreement so I am surprised to now hear they are saying the lists were rejected,” Lowenfield said. 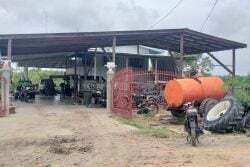 He said that as a result of the call he contacted the person who is tasked with the responsibility of having the lists gazetted and asked that his staff work today because he would have been submitting the lists. He said he cannot now guarantee that his staff would want to work today following the PPP/C’s release. “There was no rejection because there was no submission,” he maintained. Lowenfield said offices throughout the country would have placed notices on their doors since earlier in the week indicating that they would have been closed today and any business would be dealt with on Monday. Gecom Chairman Dr Steve Surujbally told Stabroek News when contacted that he was in office for the better part of yesterday and had the party turned up with the lists he would have received same. He said he had to leave in the afternoon for another engagement. Asked if the party is allowed to submit names for its regional councillors without submitting the names of its members of parliament, Lowenfield pointed out that essentially there were two separate elections—general and regional—and the law says he has to accept two sets of names regardless of the order in which they were submitted. He said if that is the manner in which the party wants to submit its lists it is fine by him and he will accept same. Meanwhile, Minister of Communities Ronald Bulkan yesterday told Stabroek News before the PPP/C’s release that all Regional Democratic Councils (RDCs) will be convened on Tuesday regardless of whether the PPP/C has named its councillors. He said the law expressly states that the councils have to be constituted no later than 14 days after the official election results would have been published and gazetted. The results were published on June 16 and as such Tuesday would be the last day to meet the legal requirement. “I don’t think they will, so the councils will enjoy a quorum because a quorum is one third of the members…The coalition has the majority in three of the councils…but in the others we do have a quorum so decisions made by those councils will be legitimate,” the minister said. The PPP/C has already complained about a campaigner for APNU, Carl Parker, being appointed acting REO in Region 9. When he was asked about this, the minister had said Parker was a qualified person who had been pushed out of the public service because he objected to wrongdoings. 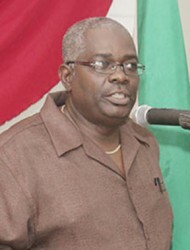 APNU and more specifically Bulkan had complained bitterly while in opposition that the former administration appointed unqualified party supporters to the position of REO, just to carry out its political mandate while locking out the voice of the people.